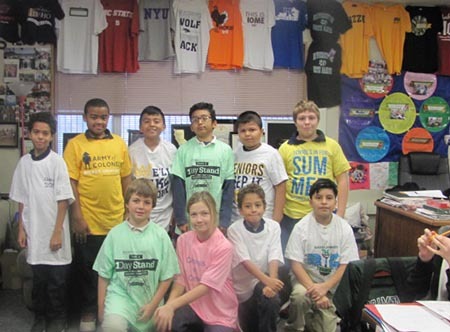 In December, Ann Marie Carey and the enrollment team received a letter from Luis, a fifth grade student from Wood Lake Elementary School in Sacramento, Calif. Ann Marie, Lauren Pluskey and Lisa Reynolds collected a total of 12 shirts to send to Luis & his classmates. "We really thought it would be nice gesture to show him, how much Wilkes University cares about education and his future," says Ann Marie. See Luis' letter here. The Employee Recognition Committee is pleased to announce that a campus-wide Employee Recognition Program is set to begin on April 1, 2016. Human Resources will sponsor three types of recognition to staff: on-the-spot awards, quarterly awards, and yearly recognition. More information regarding the "on-the-spot" awards will be coming via Wilkes Today in the coming weeks. For more information on the quarterly awards, or to nominate a colleague, please click here. For questions, please contact Kristin Pitarra at kristin.pitarra@wilkes.edu. USAC will be hosting personal & professional development programs beginning on Wed., March 16, with a Health & Wellness Lunch & Learn with Coach Keith Klahold and Kim Lynn from the YMCA. By attending, you’ll learn about the many programs both Wilkes and the YMCA have to offer to faculty and staff. RSVP by emailing usac@wilkes.edu. Save the Date: The NeuroTraining & Research Center Lunch and Learn is scheduled for Tues., April 12. Dr. Schicatano & Dr. Bohlander will give an overview of the technology available, the science behind the center and how you can apply the training in your everyday life. Join us for lunch & receive a guided tour of the center. If you are a loyal supporter of the University Family Campaign, and would like to be more involved on campus, you can volunteer as a member of the University Family Campaign Committee. Each year, this campaign raises money to help Wilkes students through employee gifts. Employees have the option to give to the Wilkes Fund or to designate their gift to a specific department or program. Each year the goal of the committee is to help spread awareness of the campaign, give feedback and bring ideas to the meetings on how to increase giving on campus. The committee meets a few times before the campaign kickoff on May 6, and a few times during the year to hear updates. If you are interested in joining the committee, please email Lauren.Pluskey@wilkes.edu or call 570-408-4331. 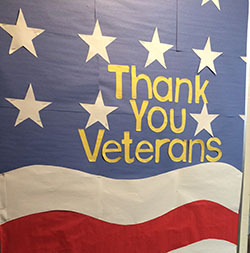 The Veterans Center of Excellence opened for the start of the spring semester in 2016. The VCE was made possible by SVA and Home Depot with the Vet Center Initiative Grant. Wilkes Veterans Council was awarded $10,000 dollars to create a one stop shop for veterans. The VCE is a designated space available to current student veterans, dependents, and members of the Wilkes University Veterans Council. 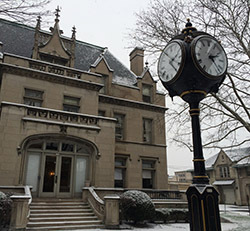 Located in the basement of Conyngham Hall, the VCE offers several different rooms for veteran use including a private computer room, lounge, professional room, and kitchen. The grand opening of the VCE is scheduled for Thurs., March 17, at 11:30 a.m. in Conyngham VCE. The School of Pharmacy is seeking volunteers from our staff and faculty to help facilitate role play scenarios with professional pharmacy students. Volunteers will “act” as standardized patients during a counseling session with P3 students by interacting with the students through conversation in brief, 7-minute scenarios. These scripted scenarios may include starting a new medicine, misunderstanding how to use a medicine, or asking for more information about a health condition. 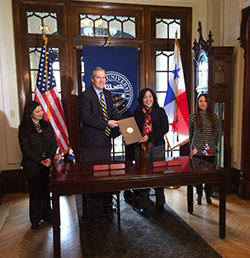 Each standardized patient will be paired with a full-time or adjunct faculty member in the School of Pharmacy. The exam will take place on Wednesday, April 13, 2015 from 8 a.m. to 12:30 p.m. and 12:30 p.m. to 5 p.m. on Wilkes' campus. Prior to April 13, a 60-minute standardized patient training will be held to introduce volunteers to the examination model and cases. Sign up online. For questions, please call Dan Longyhore at x. 4294. COMMUNICATIONS CENTER TRAINING: In 2015, Public Safety identified a leading 911 training business, Power Phone, as the provider for training our staff in the Communications Center. Power Phone has delivered more training for 911 dispatchers than anyone else in the world, having conducted more than 8,000 global dispatcher training classes for more than 200,000 public safety personnel. Communications Officers will have the enhanced ability to gather essential information for emergency responders and to instruct callers on what they should do while waiting for help. We are proud to announce that our Communications Officers are in the final certification stages of completing the most up-to-date Public Safety Telecommunicator course in the industry. This Center is staffed 24/7 by: Ms. Jill Lewis, Ms. Michelle Donohue, Mr. Scott Patterson, Ms. Ashlilyn Steblinski, Mr. Eric Duda, Ms. Karley Atiyeh, and Mr. Pat Coyne. “It was our mission to deliver a system that helps standardize the information gathering process on any emergency call,” says Chief Christopher Jagoe. “Be it an injured person, car accident, the report of smoke or fire, or a shooting in progress, the questions asked by the Communications Officer can have a direct and immediate impact on the outcome of the call. We required training for our staff to address the needs of our community.” Lt. Phil Miller and Communications Officer’s Donohue and Lewis were responsible for much of the work going into this critical upgrade of our Communications Center. RADIO SYSTEM UPGRADE: We are also in the process of upgrading our radio system to a VHF analog/digital system. This radio upgrade will allow us to monitor and communicate with other emergency responders in the area during critical incidents – something we were unable to do with the older system. Lt. Don Noble was responsible in identifying the needs and vendors for this much needed endeavor. The project is awaiting FCC approval for new frequencies. A committee comprised of the University’s Leadership Wilkes-Barre alumni will select a nominee from the University for Leadership’s 2016-2017 class. Anyone interested in being the Wilkes nominee is asked to submit a letter of interest by April 1. Learn more here. 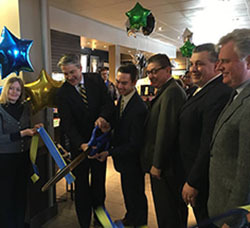 On Thursday, Feb. 18, Wilkes held a grand opening for Starbucks at Colonel Gambini’s Café. Learn more here. Sara Myers, head field hockey coach, is working with the campus community to plan events during Division III Week, April 4-8. For more information, contact Sara here. Join more than 20 of your colleagues and receive Green Zone Training from Emily McGaha from AmeriCorps Vista. Green Zone allows faculty and staff to become knowledgeable about the military affiliated student experience. These individuals lend a sympathetic ear and help the student veteran identify and connect with the appropriate resources. If you're interested in attending a future training session, email Emily at emily.mcgaha@wilkes.edu.